Bathwraps shower systems are sleek, modern, and – perhaps best of all – incredibly easy to keep clean. Their nonporous nature makes them highly resistant to the growth of mildew and mold. Unlike tile-and-grout showers, our shower systems require hardly any upkeep, cleaning, or maintenance whatsoever. Acrylic is a nonporous material that is able to maintain a “like new” appearance for years with only minimal regular cleaning. Another one of our suppliers is The Onyx Collection, a Kansas-based manufacturer of solid-surface shower bases (pans), shower wall panels, shower doors, shower drains, curtain rods, safety grab bars, and more. For more information about the high-quality shower systems that are available through U.S. Patio Systems and Home Remodeling in Des Moines, Iowa, please contact us today. 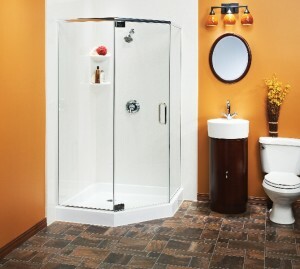 We will be honored to help you with all your bathroom needs. Along with replacement showers, we also install replacement tubs (including walk-in tubs), bathroom cabinets, flooring, lighting, mirrors, and more.